I f the high-powered SL33 is one polar end of the multihull world today, this new Sunreef 58, built in Poland and designed by the Sunreef design team, has to be the other. 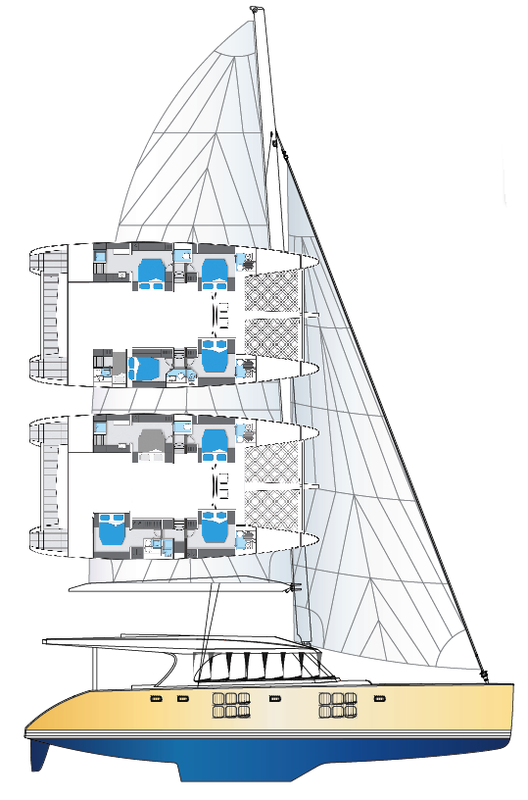 Compared to the SeaCart and the SL33, this big cat is almost a sailing island of accommodations. Clearly this design puts comfort before performance. This is a big boat. It has an LOA of 58 feet and beam of 30 feet, 2 inches. I know it's not fair, but just for giggles this is an L/B of 1.92. Initial stability will not be an issue. The D/L is around 153. Draft is only 5 feet, 5 inches, so VMG (Velocity Made Good) to weather will not be great. The keels are low aspect ratio foils that will let you snuggle up to the beach. However, when you are snuggled up to the beach the freeboard at the bow is so high I would warn you against jumping off. The hulls are symmetrical but when you get just above the DWL the inboard side of the hull flares inboard to help with the transition from the bridgedeck level to the "in the hull" level. This is always a challenge with cruising cats. The accommodations are wonderful. You can have four queen-sized double staterooms or you can add a crew "stateroom" aft in the starboard hull. Any way you want to cook it you will have four nice staterooms with big berths and adjoining heads. On the starboard side the aft stateroom has a separate head and shower area. If you go with the crew's quarters the starboard aft head gets no shower. So, and I know it's a hardship, you will have to shower on deck. When you go up to the main deck level, the saloon level, you find a very simple and very effective layout. There is a pilot station to port forward, a large dinette with a settee to port aft, and a large galley to starboard. This will be a very comfortable area. But wait, there's more. If you go out onto what most of us would call the "cockpit," it is flush with the saloon and there is another large dinette there along with a nice settee to starboard. To port there is the grand stairway up to the next level. Yes, there is more. On the flybridge level there is a centered control station and aft of that an area where girls, preferably Scandinavian Airlines stewardesses, say 5 foot, 8 to 5,10 and around 165 pounds, will lay about partially naked and amicable. This is where I will spend most of my time. After all, someone has to drive. But I'm dreaming again. I'll bring my Sunreef 58 to Seattle where I'll turn that lounging area into a lovely Japanese Zen moss garden. LOA 58'; LWL 58'; Beam 30'2"; Draft 5'5"; Displacement 57,320 lbs. ; Sail area 1,948 sq. ft.; SA/D 20.97; D/L 153; L/B 1.92; Auxiliary Yanmar 75-hp (twin); Fuel 370 gals. ; Water 206 gals.